The man who leaked the PC release of Assassin's Creed to pirates back in early 2008 has been sentenced to a fine, probation and a few months in a half-way house. 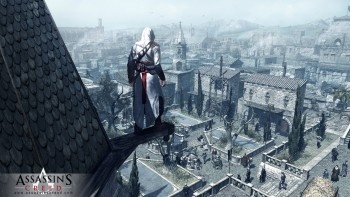 In February 2008, a man by the name of Christopher Anzalone stole a copy of the PC version of Assassin's Creed from his workplace, Optical Experts Manufacturing - the company contracted by Ubisoft to manufacture the Assassin's Creed game discs. Thanks to his efforts, the game appeared online nearly two full months before it was scheduled to be released; Ubisoft was understandably less than pleased with the situation and tracked pirated copies of the game back to Anzalone, eventually finding a copy of the game manufactured by Optical Experts in his home. Ubisoft sued OEM for $10 million over its crappy security practices, while Anzalone was charged with theft. Yesterday, he was sentenced three months in a half-way house and five years of probation, and ordered to pay $25,000 in damages to Ubisoft. As noted by Voodoo Extreme, things could have gone a lot worse for him. A criminal record is never a good thing but a $25,000 fine is basically the equivalent of a car loan: Albeit you don't get the fun of driving around in new wheels, you can at least have it paid off in four or five years. Compared to the civil suit losses suffered by people like James Burt, who was ordered to pay $1.5 million to Nintendo for uploading a copy of Super Mario Bros. Wii, or the two-time-loser Jammie Thomas, whose appeal of a $222,000 loss to the RIAA earned her a bill of nearly $2 million instead, Anzalone got off pretty easy.